By his own admission a disappointment with Barcelona last season, new Argentina coach Gerardo Martino brings his team to England for friendlies against Croatia and Portugal in London and Manchester respectively in the next few days. Likeable and down to earth, Martino found the daily grilling by the Catalan media something of a strain. The pressure in his new job will not be as constant, but it will be no less intense. His predecessor Alejandro Sabella led Argentina to second place in the recent World Cup, and Martino will want to go one step better in 2018. Indeed, if Argentina do not come out on top in Russia then some will despair of ever winning the trophy again. This year in Brazil they were gifted with a favourable draw, and coach Sabella was blessed with an awesome collection of attacking talent - with Lionel Messi, Sergio Aguero and Angel Di Maria. True, come the day, injury blunted their effectiveness. Aguero was nowhere near fitness, Di Maria broke down during the competition and Messi was running on empty by the end. But the long-term problem is obvious - who is going to replace them? The trio, and so many more in the Argentina team, are graduates of an incredibly successful youth development process. Between 1995 and 2007, Argentina won the Under-20 World Cup on five occasions, and groomed a series of top players for the senior side. But the production line has slowed down. Since the 2007 triumph Argentina's Under-20 sides have been poor. There are no ready-made replacements for the stars of the current generation - and, realistically, Russia 2018 will almost certainly be the last crack at the World Cup for Messi, Aguero and Di Maria. The bar is set high, then, for Martino. A quality attacking midfielder in his playing days - he holds the record number of appearances for Newell's Old Boys - his coaching pedigree includes four highly effective years in charge of Paraguay. His Argentina side have so far won 4-2 away to Germany, then lost 2-0 to Brazil in China and strolled to a 7-0 win over Hong Kong. Now, with a squad full of Premier League players, they come to England. They take on Croatia at Upton Park on Wednesday, and face Portugal at Old Trafford next Tuesday. These are grounds that Carlos Tevez knows well from his time in England - and Tevez has been recalled to the squad for the first time since the 2011 Copa America. With his idol status in Argentina, the stocky shadow of Tevez has been cast over the national team in recent times. Songs were even written in an attempt to persuade the coach to take him to the World Cup ('Sabella! Te olvidaste de Carlitos', by Daniel Ursini). There was always a sense, though, that some of the big names in the team did not want him. Sabella often spoke of his desire not to upset the harmony of his dressing room. By bringing him back, Martino has made a declaration of independence from the past, and also a statement that he, rather than any cabal of senior players, picks the squad. If there was a power struggle between Tevez and Messi, then there is now no doubt about the pecking order. On his arrival in London, Tevez made a point of telling the Argentine press that he was looking forward to playing with 'the number one'. It may well be the case, though, that all the fuss about Tevez has taken on a dimension bigger than it deserves. For a start, his international record (13 goals in 64 games) is on the poor side of mediocre. And at the age of 30 his shelf life is clearly limited. He will surely be past his best come the time of the next World Cup - though he may yet have a role to play in next year's Copa America, a competition Argentina have not won since 1993. But also he sees himself as a centre-forward, a position where Argentina have an embarrassment of riches. And what the tinkering Martino has done to the team makes it even harder for Tevez to have a long-term international future. 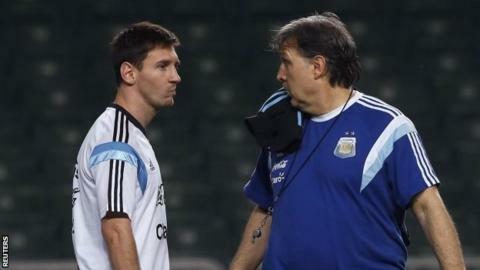 In qualification for the last World Cup, Sabella played Messi behind Aguero and Gonzalo Higuain. Martino has retained the 4-3-3 shape, but prefers to have more natural width in his attacking line. So far with his team it has been a case of either Aguero or Higuain - the addition of Tevez means that three men are now battling for one slot. Martino would surely love to have the same strength in depth at the other end of the field. In a way, the injuries to the stars during the World Cup proved beneficial to the team. They allowed Sabella to adopt a more cautious game plan and drop deeper, protecting his sluggish defensive line. The problems of a bolder approach were clear in the recent friendly against Brazil. For almost half an hour Martino's Argentina were entirely dominant. But from the moment a defensive lapse handed Brazil the lead, it was a different game. The final margin of defeat could have much wider than 2-0, with the speed of Neymar carving Argentina apart on the counter-attack. Martino's team will want to take the initiative and carry the game to the opposition - making it imperative that Argentina come up with some quicker, better defenders. Martino was at White Hart Lane on Sunday to see with his own eyes that Federico Fazio, introduced to the squad for the games against Croatia and Portugal, is very unlikely to offer a long-term solution. If Tevez was a pacy, strapping centre-back, he could upset as many people as he likes and still walk into the team. Goalkeepers: Sergio Romero (Sampdoria), Willy Caballero (Manchester City), Nahuel Guzman (Tigres). Defenders: Nicolas Otamendi (Valencia), Cristian Ansaldi (Atletico Madrid), Facundo Roncaglia (Genoa), Martín Demichelis (Manchester City), Pablo Zabaleta (Manchester City), Federico Fazio (Tottenham), Jonathan Silva (Sporting Lisbon), Santiago Vergini (Sunderland). Midfielders: Javier Mascherano (Barcelona), Ever Banega (Sevilla), Roberto Pereyra (Juventus), Lucas Biglia (Lazio), Angel Di Maria (Manchester United), Erik Lamela (Tottenham), Javier Pastore (PSG), Enzo Perez (Benfica), Nicolas Gaitan (Benfica). Strikers: Carlos Tevez (Juventus), Lionel Messi (Barcelona), Gonzalo Higuain (Napoli), Sergio Aguero (Manchester City).